Video (03:01) : Wolves coach Tom Thibodeau and star Andrew Wiggins discuss his contract extension announced Wednesday. Rest easy, Wolves Nation: Young star Andrew Wiggins has signed that max $148 million contract that will keep him obligated to the Timberwolves through 2023. An agreement he talked about on media day weeks ago as practically done was finalized just five days before the Oct. 16 deadline to do so. "It's a relief," he said at a news conference at the Wolves' practice facility. "It's money most people don't see in a lifetime. It's a blessing." Said Wolves coach Tom Thibodeau: "He can put it in the drawer and lock into the basketball part of it. Not to get lost in anything but chasing excellence. He’s never satisfied, always wants to get better. What he’s done so far is impressive, but it’s scratching the surface." Wiggins said he and his teammates were focusing on one thing: "Getting the championship." "I have so much more to accomplish," the 22-year-old guard said. "The main goal this season is to have a playoff run, surprise people. 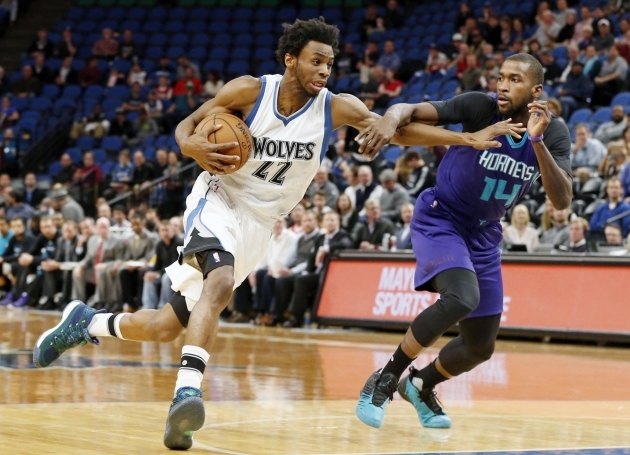 In a team statement, Wolves owner Glen Taylor said he was "pleased" to reach an agreement with Wiggins. "Andrew is one of the best young players in the NBA and he has the talent and work ethic to get even better and be a foundation for our franchise for many years." Wiggins, 22, registered a career-high 23.6 points, 4.0 rebounds, 2.3 assists and 37.2 minutes in 82 games last season, making a career-best 103 three-pointers on a career-high 35.6 percent shooting percentage from beyond the arc. Wiggins averaged 26.0 points over the final 30 games in 2016-17, including 28.3 ppg in eight April starts. The 6-8 forward registered five 40+ point games a season ago, including a career-best 47-point performance on November 13 vs. the Los Angeles Lakers. For his career, Wiggins has played in 245 of a possible 246 games, averaging 20.4 points, 4.1 rebounds and 2.1 assists in 36.2 minutes per game. Only three players (LeBron James, Kevin Durant and Carmelo Anthony) scored more points before their 22nd birthday and Wiggins’ 4,995 career point total ranks sixth on the Wolves’ all-time scoring list. Wiggins won the Eddie Gottlieb Trophy as the NBA’s Rookie of the Year following the 2014-15 season in which he averaged 16.9 points, 4.6 rebounds and 2.1 assists, becoming the first Wolves player to win Rookie of the Year honors. Wiggins was selected first overall in the 2014 NBA Draft by the Cleveland Cavaliers and traded to the Wolves on Aug. 23, 2014.